In the past, the thought of working with yeast used to put the fear in me. When I read a recipe and saw that yeast was involved, I just tossed the recipe aside and thought I didn't have anytime for such craziness. Since being unemployed (not by choice), I thought it would be great to conquer my baking fears and stop being such a pansy around yeast. When I saw this recipe for English Muffin Toasting Bread on the King Arthur Flour website, I thought it would be a great bread to start conquering my yeast fear. Plus, I had a huge batch of strawberry butter that needed to be used! I like this bread. I thought it was fairly easy to make and I love the flavor. I did think it was a lot better when toasted, I mean, it is a "toasting bread". If you have "yeast anxiety" like I used to have, I suggest you give this a try. Pour the hot liquid over the dry ingredients in the mixing bowl. Beat at high speed for 1 minute. The dough will be very soft. Lightly grease an 8 1/2" x 4 1/2" loaf pan, and sprinkle the bottom and sides with cornmeal. Scoop the dough into the pan, leveling it in the pan as much as possible. Cover the pan and let the dough rise till it's just barely crowned over the rim of the pan. When you look at the rim of the pan from eye level, you should see the dough, but it shouldn't be more than around 1/4" over the rim. This will probably take over 45 minutes to an hour, if you heated the liquid to the correct temperature and your kitchen isn't very cold. While the dough is rising, preheat the oven to 400 degrees. Remove the cover and bake the bread for 22-27 minutes, till it's golden brown and the internal temperature is 190 degrees. Remove the bread from the oven and let cool in pan for 5 minutes. Then turn bread out on a rack to cool. Let the bread cool completely before slicing. *I found that it is best to use a thermometer. You can find them in the kitchen section of places like Wal-Mart and Target for around $3-$5. People are different when it comes to how much heat they can take when it comes to feeling it, so I just found that using a thermometer to get a true reading was best for me. I'm still trying to get over my fear of yeast as well! I made cheesy buns for a party once and on a total whim a cinnamon swirl loaf after being inspired by a post from Amy [fearless homemaker]. I still, though, get the sweats before getting everything mixed together, fingers crossed that the yeast will do its thing. Love the looks of this recipe! And that strawberry butter - woah mama! 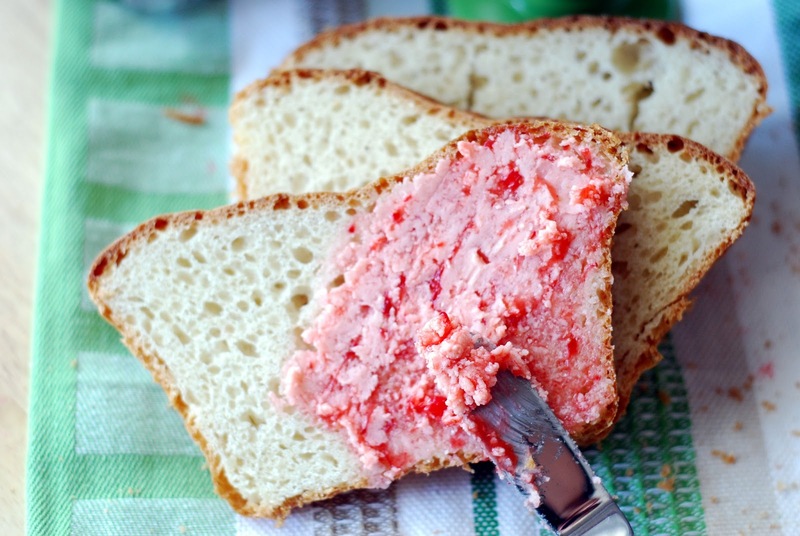 Strawberry butter looks gorgeous and congrats on working with yeast. Sorry to hear about you job, though. King Arthur has some really awesome recipes. I have A LOT of cookbooks, but my King Arthur cookbook gets pulled most often! 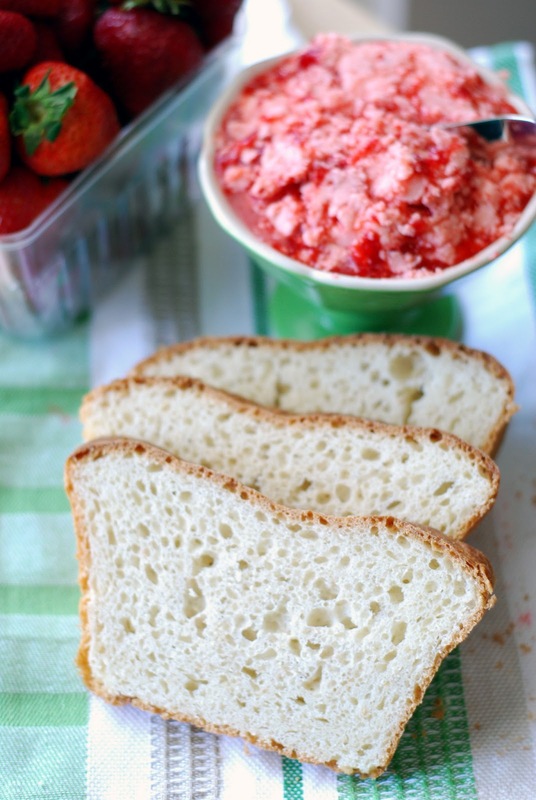 Your bread looks delicious, especially with that strawberry butter! YUM! So Yummy! It is looking so Delicious. Thanks for share.